Summer has slowly made its way to Seattle, and for the first time since I was little, the warm weather means bike rides! A couple months ago (when spring was here and we were eagerly awaiting summer), we found the sweetest blue bike in the basement of an estate sale in our neighborhood. I had an instant crush on this bike. It's everything a bike should be! We initially walked away from the house (we certainly hadn't budgeted to get me a bike, nor did we bring enough cash), but I was really sad to leave it behind. I just kept thinking about the two of us riding bikes all summer...and it was too sweet a thought to give up! Brad (who loves me a ton) negotiated the seller down to a somewhat manageable price, and we took my new/old bike home! She's a bright blue 1973 Schwinn Speedster, made originally for boys. (But an adult woman is the size of a medium boy, right? Whatever.) She got chrome fenders, all original parts (minus one nut that we replaced), and a lot of style. We've had a ton of fun so far, going on bike adventures in our neighborhood and riding to the farmer's market to fill my basket (it's brand new, so not in the photos) with fresh fruit & veggies. I love every season in Seattle, but with a bike and some sunshine... summer really can't be beat. Our good friend Josh did this linoleum carving awhile back, and we've been so crazy busy that it hadn't gotten printed. But once my bike obsession kicked in, it was certainly time to drop everything and make this fun bike print! The carving is all Josh, the tag line is all Brad, and when it was time for me to print it, I color matched the ink to my bike! Want to celebrate a summer of cycling in your home? 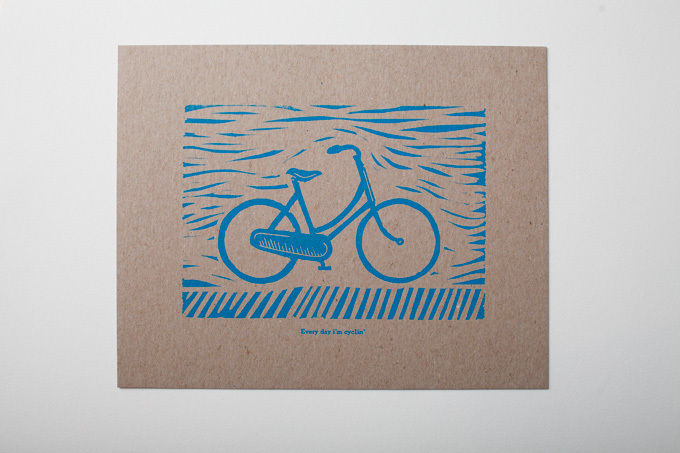 Our new bike print is available on our Etsy store. Bike photos from my Instagram stream, the only way I'm documenting life at the moment.